In a previous post, I wrote about how it’s impossible to price an object in a game according to a systematic formula, barring games of limited complexity, and objects that cover the same span (that is, there are just different multiples of the same vector). Instead I claimed at the time it was just arbitrary- that designers could set the prices to whatever they liked and that the game would always be fair so long as each player had equal opportunity. Thus, the designer’s job is really just to play with the prices until it produces the interplay he is looking for. In another post, I wrote about how research in RTS games, and why spending resources in order to have the option to train new units can payoff. While upgrades obviously boost the strength of an army, research unlocks news units for a price, and that price is only worth paying if one can expect to use the unlocked units in such a way, that the utility of their use exceeds the initial cost of research. Thus, the price of research is also arbitrary. Having since studied microeconomics, I’d like to revisit these topics. 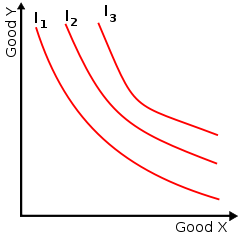 An indifference curve is a line that shows combinations of goods among which a consumer is indifferent. Economists call the phenomenon I just described the marginal rate of substitution or MRS for short. Formally, the MRS is defined as “the rate at which a person will give up good y for good x while remaining indifferent”. In other words, it’s the price at which you are willing to buy something using something else (ie, how much you are willing to shell out for a can of soda). What’s interesting about the MRS is that it changes- the more a person has of good x, the more one is willing to trade of good x for good y. Said another way, because billionaires have so much money, they don’t mind paying $5.00 for a hot dog. This is a far more intuitive way of looking at things than trying to predict prices from the attributes of the game objects. In short, all one needs to understand now is that players will buy an object when the utility of a object exceeds its cost. While the main point I wanted to convey has been made, I want to just put down some related ideas that don’t exactly deserve a post of their own but that I think are worth sharing. -If you are familiar with Dominion, you may know MRS as “the Silver test”. (If you are not familiar with Dominion, all you need to know is that players regularly face the choice of buying cards with special effects or treasures, such as a Silver, which increase income.) That is, when making a non-trivial purchasing decision, one always has to consider if the object at hand is in fact better than a Silver. What I find most interesting about the Silver test is how many players completely fail to pick up this rule, instead being regularly mislead by the incorrect assumption that “things that cost more must be better”. Certainly changed a few paradigms of mine after noticing what was going on. -Knowing when to buy what is the backbone of many games. In Dominion, playing cards is fairly trivial- but the decisions of which cards to buy each turn is often rather complex, and in the majority of cases, determines who wins. Likewise, in StarCraft, micro-ing units is fairly simple- but, again, the decisions of which units to buy and which tech to research is far more complex, and is far more important than any tactical feat. In short, your economics textbook may be more valuable than The Art of War. Real Time Strategy games are the same way, which often makes it hell to talk about them with people because there are so many factors that we may as well be predicting how a drop of dye will spread if we were to drop it in a glass of water. When I made Naval Commander, besides wanting to producing a simple version of the RTS for simplicity’s sake, my intention was partly to put to use a few of the formulas and thoughts that my friend Vinh and I had conjectured. However, even that was clearly too high-level to make any sense of. High damage – Good against heavily armored targets. Bad against low hit point targets. Low damage – Bad against heavily armored targets. Large range – Good against slow moving targets. Loses value when overkilling. So we can see some cool things with just the small list. Since an offense consists of some amount of damage, some attack speed, and some range, we can create a 2*2 interesting units with these pieces. For example, one might construct an anti-armor unit whose job is to put heavy damage on armored targets. Such a unit would exclusively need a high attack damage. Likely, he would have a slow attack speed to keep his cost down, and he would be extremely susceptible to units with low hit points who he would expend too much damage on. Armed with these basic components (or at least the realization of the need to break things down into their smallest parts) we could construct an entire RTS game which would provide interesting choices to the players, without any kind of need for tactical unit abilities, requiring instead only tactical movement. Before I can explain the combat effectiveness of a heterogeneous group, I need make sure the reader understands a few things first. First, recall that in homogeneous groups, every additional unit increases the strength of the group exponentially. Recall also that a rational player will target enemy units according to their Offense to Defense ratio, the highest of which will be targeted first. With that in mind, I can explain. Let’s consider the simple case of a group of two units, one unit with 1 Offense (O) and 1 Defense (D), and the other with sqrt(3) O and sqrt(3) D. Since both units in the group have the same Offense to Defense ratio, the order in which our enemy targets our units is unimportant and therefore we can calculate the strength of our group against the Universal Unit to get a K-value for our group. That said, it comes out to be (1 + sqrt(3))*1+sqrt(3)*sqrt(3)=4+sqrt(3) ~= 5.73K. Notice though, that the unit with sqrt(3) Offense and sqrt(3) Defense has a K-value of 3, which means it worth exactly twice as much the other unit. That is to say, the value of our group is $1 + $2 = $3. However, notice that $3 worth of 1O, 1D units produces an effective strength of 1+2+3=6K. This suggests that my previous suggestion of how to price units is not adequate. Things break down even more when the Offense to Defense ratios are different. If a player rationally targets the unit with the highest Offense to Defense ratio, he will make heterogeneous groups even less effective. Consider for example, another group worth $3, except this time composed of a unit with 1 Offense and 1 Defense and a unit with 1 Offense a 3 Defense. In this case, the 1 Offense, 1 Defense unit is more threatening, and so with that unit targeted first the group’s strength comes out to a measly (1+1)*1+1*3=4K. Should the player have done otherwise, he would improved the group’s strength to an impressive (1+1)*3+1*1=7K. What is important here in the middle factor, the D1O2. Typically, if Unit 1 and Unit 2 were the same price we would want to D1=O2, since if D1!=O2 then D2!=O1, and since our opponent gets to choose which unit he will target first, he will always pick the unit that makes the middle term smallest. Thus we try to make D1O2=D2O1, or equivalently D1/O1=D2/O2. Therefore, homogeneous groups are typically the most effective. However, it is sometimes possible to force our enemy to attack our units in the way that we want him to. In this case, we want very heterogeneous units. In fact, if we could have it, we would have our units as different as possible- give one with infinite Offense and infinitesimal Defense and the other infinite Defense and infinitesimal Offense, and we get a middle term that equals to infinity^2! As we can see, prices cannot possibly be determined by looking at stats alone. In fact, prices for units are completely arbitrary- fine-tuned to make the game play as the designer intended. Likewise, the strength of units cannot be measured, since units rarely fight alone or in purely homogeneous groups. Only so long as prices keep the decisions interesting then they are completely left to the designer’s discretion. So while surfing for a solution to my own AI problems, I found an article on potential fields. I had used these before in trying to develop an AI for Naval Commander, and achieved limited success, but I couldn’t figure it out well enough and so I ditched the whole thing. Anyway, a potential field is kind of like a magnetic field. Basically, the AI places charges around the map, positive charges near high value targets, and negative ones around dangerous areas and impassable terrain. Allied units use the field by testing a few points around them, figure out where the most potential is, and moving toward the location. By strategically placing the charges, the AI can guide armies in a very dynamic and simple way. So here our potential field is represented by the lightness of the square, with light squares being more attractive. The rocks, being impassable, and the white enemies, being dangerous, emit negative potential, coloring the nearby squares dark, while the goal areas emits positive potential, lighting the map up. Together, these fields provide a way for the green unit to get to its destination all without any kind of path finding algorithm. The article goes on to explain a few useful tricks, such as placing positive charges on top of enemy units to attract allied units to them, and then placing a weaker negative charge on top of them in order to get our units to attack from a certain range. Anyway, I think there is a lot of potential with this idea. I highly recommend you check the article out and you can count on me investigating the idea in the future. The new AI works by allowing each planet to store the number of armies that it needs to conduct the AI’s plan. It sends that value to it’s parent node, and that goes all the way up, so that all the nodes know how much they need to conduct the AI’s plan. 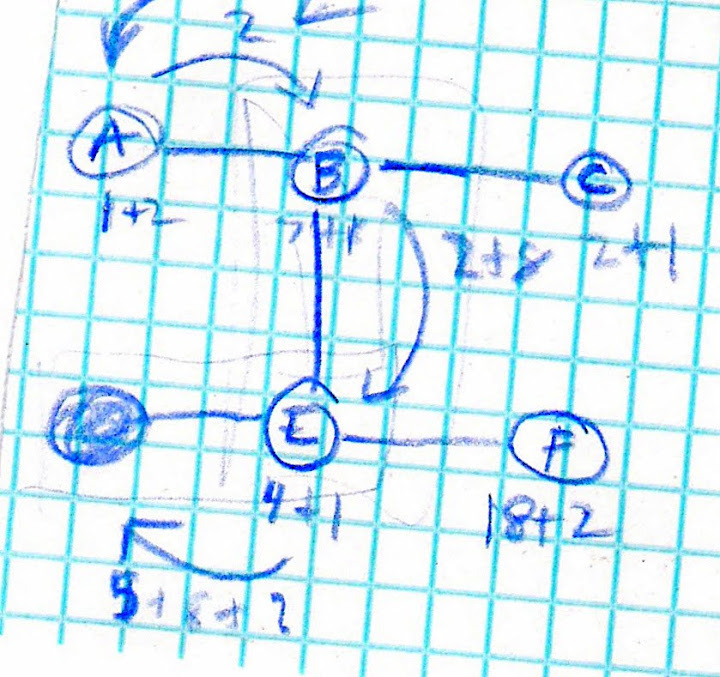 The image at the right is a little hard to read, but basically, node A tells B that it needs 2 armies, then B tells E that it needs 10, 2 to capture A and 8 to capture itself. The process, repeats upward. This works for terminal nodes, so why doesn’t it work for B? The problem, I’m almost certain, is that I’m using a depth first search, and A is never being notified that B is receiving enough forces to capture A. Now that would be very easy to fix, except that if I did that, then E would never send to B, since it would consider A and B both captured. Anyway, I need some help. Building off of 0.02, I made a few changes to the algorithm. In the old algorithm, the search would stop whenever it hit an enemy node. However, that would prevent it from seeing anything beyond the front line, which could potentially be a problem. If, for example, our base connects to a 10+1 node and a 25+1 node, both the same distance away, our base should probably attack the 10+1 node. However, if behind the 25+1 node is a 0+100 node, then we may wish to rethink our initial decision. Additionally, I rewrote parts of the code here and there to make things a little more organized for myself. With that, I’ve created an AI for Red, to showoff in the videos anyhow, but for the player I’ve implemented a new system for attacking. Where previously, a player’s click would send all immediately available units to the targeted node, the new system is set up so that it not only does that, but continues to stream afterward. The stream can be disabled by clicking the streaming node twice.